The compact integrated design makes this alarm clock a best fashion home decor. It's fit for all scenes such as your bedroom, study room, living room, office. Why you choose this clock? 9 extra minutes of snooze by clicking the big SNOOZE button. 4 brightness level switchover by clicking the Brightness Control (SNOOZE) button. 3 alarm sounds by clicking the "+" button under alarm sound chosing mode. This alarm clock is easy to set cause all you need is to familar with three buttons: "-", "SNOOZE/Brightness Control" and "+". There are two Snap Switches on the back of the clock. The default position of both switches is at middle. When you want to set Time, please push upward the right Snap Swith to "TIME" and push back to the middle "Lock" after finishing the setting. When you want to set an Alarm, please push downward the right Snap Switch to Alarm and push back to the middle "Lock" after finishing your setting. Alarm clock built-in USB port is convenient for you to charge your iPhone, iPad, or MP3 player, and they will be fully charged every morning. AC powered; Power Adapter needed but NOT included). 5-inch Curved Screen Large borderless curved screen with clear LED digit display is easy for everyone to read time. 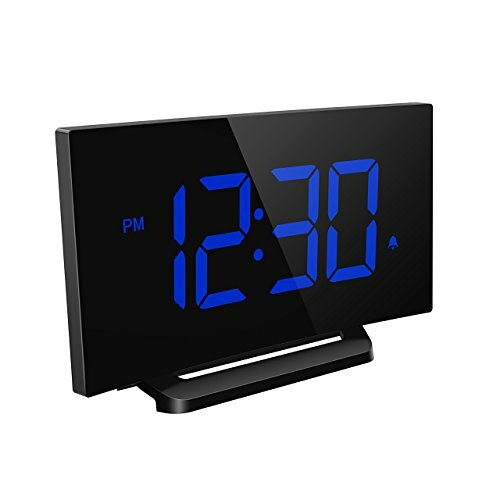 The compact integrated design without bottom base makes this digital clock look compact, portable and stylish. It's fit for all scenes like: bedroom, living room, office. Simplest Operation Abandon the past complex button settings, we only leave three function buttons and two Snap Switch for this clock to realize all operation. Three buttons can resolve all needs.For more convience, we specially make the SOOZE/Brightness Control button larger. 3 Euphonious Alarm Sounds Varies from the common dull alarm sounds of other alarms, this sleep timer has three euphonious alarm sounds: Tweeting, Sea waves and Chording, and two sound volume 65dB/75dB are available for choice. Further, you will have extra 9-minute snooze if you click the Snooze button. Adjustable Display It has 6 brightness level so as to protect your eyes. You can turn off the LED display or adjust the brightness from Low - Medium - Bright. You can choose between 12-hour time system display and 24-hour system display. The built-in battery keeps the memory of all settings during a power outage. 5V/1.2A USB output at the back allows you to charge your phone. What You Get? 1x Digital Alarm Clock; 1x Mirco USB Cable; 1x User Manual Note: AC Adapter needed but NOT included). PICTEK 18-month warranty and 45-day Refund promise. Please email/call us when you have any issue to get earliest customer support. The Langston Grandfather Clock by Howard Miller is finished in Windsor Cherry on select hardwoods and veneers. Split pediment features turned finial, book matched rare olive ash burl overlay, and decorative shell overlay. Polished brass-finished dial with corner spandrels, center disk, and silver chapter ring with applied brass Arabic numerals. Illuminated moon phase dial, for twinkling star effect. Decorative olive ash burl pattern on inside back panel. case is illuminated. Polished brass-finished pendulum with center disk and weight shells. Reeded columns with turned top and bottom caps. Sculpted base offers a decorative cutout. Howard Miller offers a warranty which is our promise and commitment that our products have been manufactured using the finest materials and have been thoroughly inspected prior to being shipped from our facilities. Our warranty is available exclusively through authorized retailers only. Please inquire with any 3rd party seller prior to purchase to confirm warranty eligibility. Purchases made from unauthorized retailers will not be eligible for warranty services through Howard Miller or its authorized service center network. With simple and modern design, this alarm clock is easy to operate and you will hardly need instructions to operate this clock. Compact clock (1.5x5.75x3inch) ideal for any living room d cor. Mpow digital alarm clock features a large, 3.75-inch LED for increased visibility. The time and alarm indicator are clearly displayed on it. Time displays can be changed between 12 and 24 hours formats. Enjoying waking up by nature's sound: wave, bird's singing or chord ringtone. The alarm volume can be set to high or low with one button switch. NOTE: The alarm sound can last about 30 minutes. With large snooze button on top of bedroom clock, mornings just got easier. Enjoy a comfortable and prolonged wake-up with the 9 minutes snooze option, and experience zero stress when setting the time or alarm. 1. In the Time Display mode, press "+" button once, it will play one ringtone. 2. Press the "+"button once more, it will switch to other ringtone. Three ringtones can be changed circularly. NOTE: Before selecting the ringtones, please push the button to the "LOCK" position. Mpow product includes a 45 days money back and 18-month warranty. SIMPLE AND EASY TO OPERATE: Mpow Aries alarm clock is simple and easy to operate. Experience zero stress when setting the time or alarm. The OFF button provides easier and quicker control. Great clock for kids, seniors and the elderly. 3.75 INCH LED DIGITS WITH DIMMER: This digital clock is clear to see the time at a glance. 4 adjustable brightness, this clock can be chosen according to your own personal comfort level. 12/24 hours format can be switchable. 12hr display with PM indicator. ALARM CLOCK WITH ADJUSTABLE BELLS: Mpow bedside clock is designed with 3 alarm sounds like wave, bird's singing or chord ringtone, lasts about 30 minutes to wake you up, adding a good mood for starting your new day. NOTE: 2 Adjustable volume without the function of getting incrementally louder for you to choose: 65dB or 75dB, without the incremental volume function. SNOOZE AND BACKUP FUNCTION: A large SNOOZE button on the top of Mpow digital clock stops the alarm and rings again after 9 minutes. Perfect for heavy sleepers. Built-in backup function, this alarm clock can maintains the clock time, alarm settings during power outage. COMPACT STREAMLINE ALARM CLOCK: Small size that even can fit in palm of your hand, the bedside alarm clock won't take much space but definitely will catch your attention. 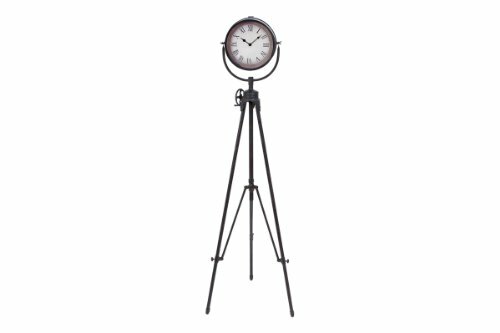 The streamline design of clock matches for any living room d cor, great choice for office, workshop and bedroom. Warranty: Every Mpow product includes 45 days money back and 18 month worry-free warranty. 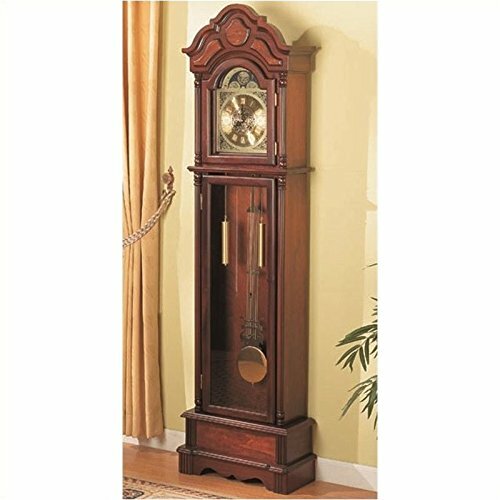 This Clock is Constructed in hardwood and veneers, graced in dark cherry finish and traditionally styled, this grandfather clock will assure you an endless charm lingered with elegant style for your decor. The Carved molding and panel detail, Carved apron,Polished hardware and Bracket footing and timeless piece of craft will endow your entire home with enough passion and flair. Carved bonnet top; Carved apron; Carved molding and panel detail. With simple and modern design, this alarm clock is easy to operate and you will hardly need instructions to operate this clock. Compact clock (L*W*H:5.75x3x1.5inch) ideal for any living room d cor. 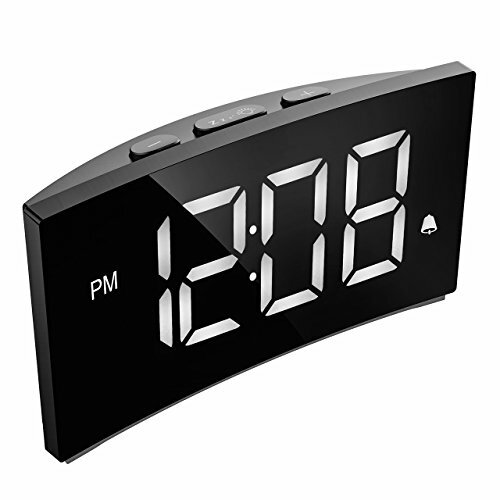 Mpow digital alarm clock features a large 3.75-inch LED digits with 6 adjustable brightness for increased visibility. The time and alarm indicator are clearly displayed on it. Time displays can be changed between 12 and 24 hours formats. Enjoying waking up by nature's sound: wave, bird's singing or chord ringtone. NOTE: The alarm sound can get incrementally louder, lasting about 30 minutes. With large snooze button on top of bedroom clock, mornings just got easier. Enjoy a comfortable and prolonged wake-up with the 9 minutes snooze option, and experience zero stress when setting the time or alarm. 3.75 INCH LED DIGITS WITH DIMMER: This digital clock is clear to see the time at a glance. Upgraded with 6 adjustable brightness, this clock can be chosen according to your own personal comfort level. 12/24 hours format can be switchable. 12hr display with PM indicator. ALARM CLOCK WITH ADJUSTABLE BELLS: Mpow bedside clock is designed with 3 alarm sounds like wave, bird's singing or chord ringtone, lasts about 30 minutes to wake you up, adding a good mood for starting your new day. NOTE: 2 Adjustable volume with the function of getting incrementally louder for you to choose: 65dB or 75dB. The Bronson Grandfather Clock by Howard Miller is finished in Golden Oak on select hardwoods and veneers. Arched bonnet pediment features three-part book matched rare olive ash burl overlay. Polished brass-finished dial with corner spandrels, center disk, and silver chapter ring with applied brass Arabic numerals. Illuminated moon phase dial, for twinkling star effect. Decorative olive ash burl pattern on inside back panel. case is illuminated. Polished brass-finished pendulum with center disk and weight shells. Reeded columns with turned top and bottom caps. Sculpted base offers a decorative cutout. Howard Miller offers a warranty which is our promise and commitment that our products have been manufactured using the finest materials and have been thoroughly inspected prior to being shipped from our facilities. Our warranty is available exclusively through authorized retailers only. Please inquire with any 3rd party seller prior to purchase to confirm warranty eligibility. Purchases made from unauthorized retailers will not be eligible for warranty services through Howard Miller or its authorized service center network. The Earnest Wall Clock by Howard Miller has a distressed Hampton Cherry finish on select hardwoods and veneers. Howard Miller offers a warranty which is our promise and commitment that our products have been manufactured using the finest materials and have been thoroughly inspected prior to being shipped from our facilities. Our warranty is available exclusively through authorized retailers only. Please inquire with any 3rd party seller prior to purchase to confirm warranty eligibility. Purchases made from unauthorized retailers will not be eligible for warranty services through Howard Miller or its authorized service center network. Traditional chimes sound the hours with the Coaster Furniture Westminster 71.75 in. 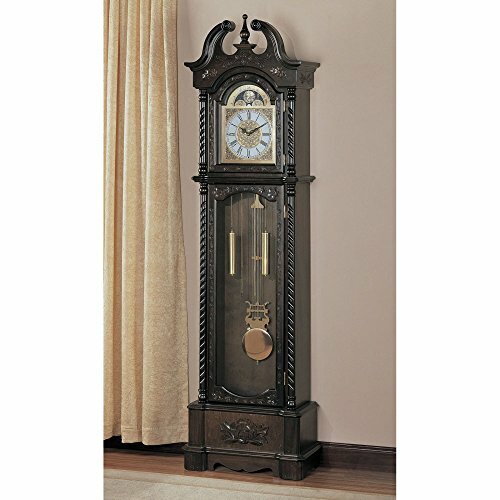 Grandfather Clock to create a richly-toned, antiqued addition to your decor. This wooden grandfather clock's heirloom-quality construction creates a lasting accent for your living space. The tapered frame and warm brown finish enhance the elegance of its look. Dimensions: 20W x 9D x 71.75H in.. Constructed from a veneer hardwood. Dark brown finish. Battery operated movement (not included). Westminster clock chimes. Features quartz movement. Dimensions: 20W x 9D x 71.75H in. Bring an heirloom-quality accent to your living space with the Coaster Furniture Westminster 81.5 in. Grandfather Clock. 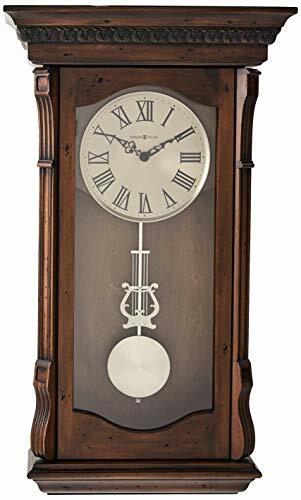 This elegant wooden grandfather clock offers traditional timekeeping with a rich chime to signal the hours, and a glass viewing panel to enhance the visual appeal. Classic carved details and a warm brown finish complete the look in timelessly sophisticated style. Dimensions: 23.75W x 11.75D x 81.5H in.. Constructed from a veneer hardwood. Dark brown finish. Battery operated movement (not included). Westminster clock chimes. Features quartz movement. Dimensions: 23.75W x 11.75D x 81.5H in. This clock's versatile, fashion forward design will fit many different home decor styles. It will even complement Steampunk decor. Howard Miller offers a warranty which is our promise and commitment that our products have been manufactured using the finest materials and have been thoroughly inspected prior to being shipped from our facilities. Our warranty is available exclusively through authorized retailers only. Please inquire with any 3rd party seller prior to purchase to confirm warranty eligibility. Purchases made from unauthorized retailers will not be eligible for warranty services through Howard Miller or its authorized service center network. This clocks versatile, fashion forward design will fit many different home decor styles. It will even complement Steampunk decor. A 24.5 hourglass in the middle of case features a sand timer of approximately one hour and can be rotated and positioned by hand. Heavily distressed, weathered wood finished base with metal X accenting the front and back. The Flimour Oak Grandfather Clock features wonderful design and great traditional fascination made with refined carvings, cute garnish and warm oak finish. The clock highlights opulent gold and silver toned clock face and pendulum, tall sash-door and a little one on in front of face. This accent decor is also made from solid hardwood finish, crafted by respected craftsmen so you can enjoy it for years to come. This Flimour Oak Grandfather Clock is truly an eye catching piece. Dress up your home decor with this beautiful grandfather clock and amaze your guests the next time they will visit. Dimension: 27" x 11" x 84"H.
The tripod and bezel design was inspired by retro Hollywood movie lights. Finished in aged Auburn with light distressing on select hardwoods and veneers, with lightly brushed, polished nickel-finished metal accents. Howard Miller offers a warranty which is our promise and commitment that our products have been manufactured using the finest materials and have been thoroughly inspected prior to being shipped from our facilities. Our warranty is available exclusively through authorized retailers only. Please inquire with any 3rd party seller prior to purchase to confirm warranty eligibility. Purchases made from unauthorized retailers will not be eligible for warranty services through Howard Miller or its authorized service center network. The J.H. Miller II grandfather clock by Howard Miller Is finished in Windsor Cherry on sixteen different species of rare woods. Swan neck pediment crowned with three carved finials, two carved rosettes, and a carved finial shell, plus book matched Russian Walnut Burl with floral inlays framed with a Movingue border with Ebony and Maple accent lines. Ornate polished brass, Roman numeral dial features custom cast corners, center, and moon arch ornaments. The cast center disk is numbered and features a removable engraving plate for personal inscriptions. "Limited Edition" is inscribed across the hemispheres. The dial includes a special brass finished moon phase. Decorative polished brass lyre pendulum features cast center disk with a spun silver background, and weight shells embellished with decorative bands with a silver-tone background. Howard Miller offers a warranty which is our promise and commitment that our products have been manufactured using the finest materials and have been thoroughly inspected prior to being shipped from our facilities. Our warranty is available exclusively through authorized retailers only. Please inquire with any 3rd party seller prior to purchase to confirm warranty eligibility. Purchases made from unauthorized retailers will not be eligible for warranty services through Howard Miller or its authorized service center network. 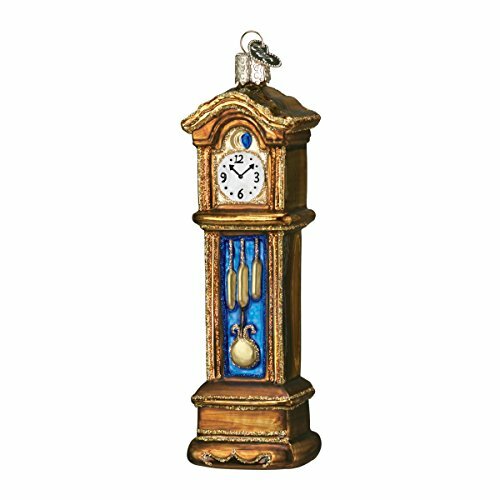 The ornate polished brass, Roman numeral dial features custom cast corners, center, and moon arch ornaments unique to this clock. The cast center disk is numbered and features a removable engraving plate for personal inscriptions. Limited Edition is inscribed across the hemispheres. The dial also includes a special brass finished moon phase. 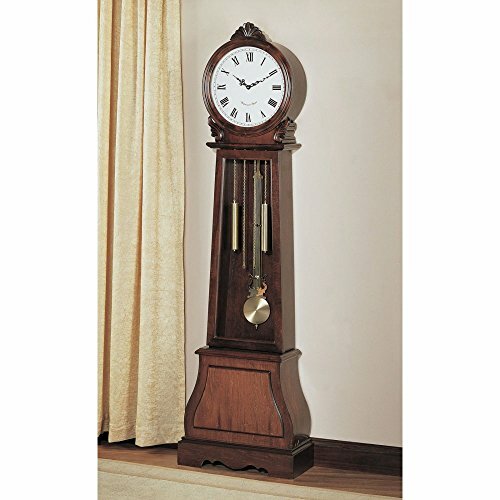 This Stunning Deep Cherry finish Grandfather Clock will add an aura of sophisticated elegance to any decor. 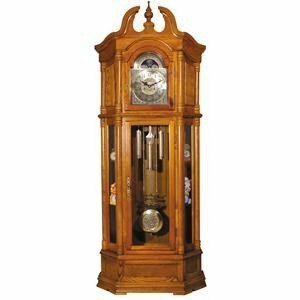 Constructed from quality woods, this Grandfather Clock features Fluted moldings and Carved panel It also have a Carved open fretwork bonnet top and 2 wood framed glass doors where You will enjoy the sound of the chimes with family. This Grandfather Clock is a great accent item for your home. Some assembly may be required. Dimension: 22" x 10" x 82"H.
Driftwood finish on select hardwoods and veneers is heavily wire brushed for a natural, reclaimed wood appearance. Howard Miller offers a warranty which is our promise and commitment that our products have been manufactured using the finest materials and have been thoroughly inspected prior to being shipped from our facilities. Our warranty is available exclusively through authorized retailers only. Please inquire with any 3rd party seller prior to purchase to confirm warranty eligibility. Purchases made from unauthorized retailers will not be eligible for warranty services through Howard Miller or its authorized service center network. A modern, abstracted take on the classic grandfather clock, this Grandfather Clock evokes a centuries-old design in a 3.5 x 17-inch wall mounted clock that only shows the nine and three hours on the face. Designed by Rob Price the piece conveys wit and playfulness, but is also 'timeless' in its design. Made from MDF fiber board and plexiglass. Requires 2 AA batteries (not included). The Grandfather Clock stands regally in the hall counting off the minutes and hours every day. It is prominently featured in nursery rhymes and fairy tales alike. In Dickens A Christmas Carol, Scrooge listens for his clock to chime and announce the arrival of his ghostly visitors. Acadia finish on select hardwoods and veneers is heavily distressed by scribes and worm holes for a natural, rustic appearance - inspired by the natural yet rustic nature of reclaimed woods in beautiful patinas and burnished details. Howard Miller offers a warranty which is our promise and commitment that our products have been manufactured using the finest materials and have been thoroughly inspected prior to being shipped from our facilities. Our warranty is available exclusively through authorized retailers only. Please inquire with any 3rd party seller prior to purchase to confirm warranty eligibility. Purchases made from unauthorized retailers will not be eligible for warranty services through Howard Miller or its authorized service center network. Acadia finish on select hardwoods and veneers is heavily distressed by scribes, and worm holes for a natural, rustic appearance inspired by the natural yet rustic nature of reclaimed woods in beautiful patinas and burnished details. In a soft blue antiqued finish, the Ackland floor clock adds a coastal themed visual to any space with its whimsical fishing pole look. This fun floor clock is a whimsical ode to fishing! Do you need a sturdy and reliable replacement for your lost or misplaced clock key? The Universal Tool 4 Way Clock Key allows for the replacement or back up of original clock keys that are often lost over time. 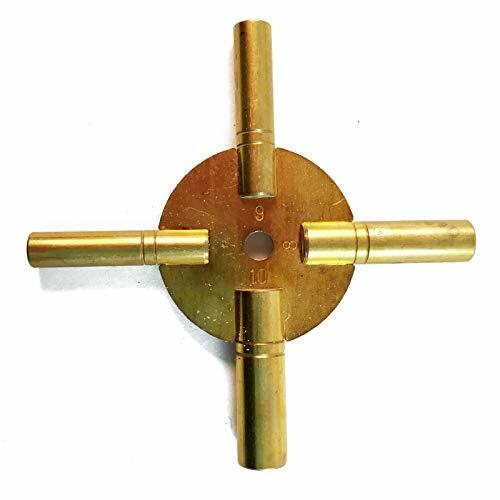 This clock key can be used to wind grandfather clocks and other antique clocks so you can restore both beauty and functionality to your special clock. The key is made of durable brass material and will last a lifetime. The sizes that come with this key are 4, 6, 8 and 10. This is a great find!